Pointe West is the premier location on Galveston Island for a first class vacation. 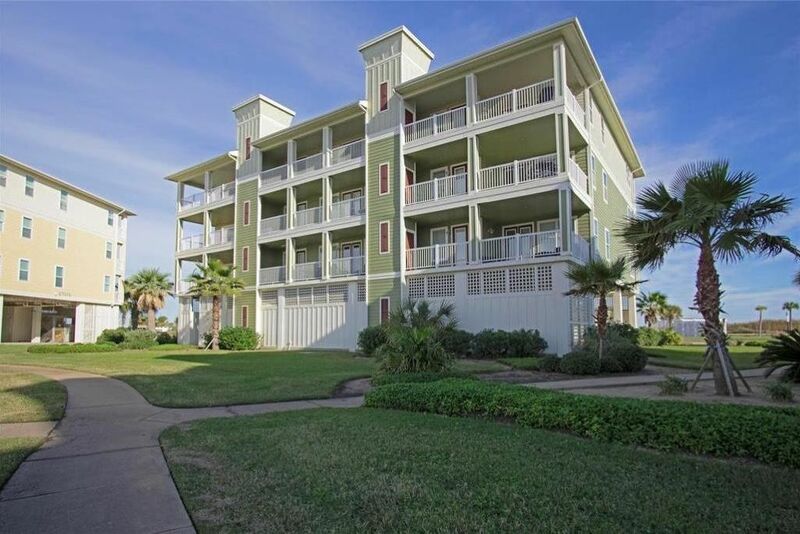 Located at Galveston's west end with many activities and spectacular views of the beach and bay all in one place. The beach club features an infinity pool with spa, restaurant, bar, fitness center, game room and planned activities for adults and children. The bayside features a tropical pool with a lazy river pool that meanders through an array of palm trees. There are miles of pedestrian, bike and golf cart trails that connect to beach and bay. Kayak and bicycle rentals are available. Bring your rod and reel for surf or bay fishing. The bird watching is great. Enjoy the most beautiful sunsets in Texas. And, a golf course is close by. This is a premium top floor condo providing privacy and spectacular views. There is a huge balcony overlooking the pool and bay, and a private master bedroom balcony with a grand view of the gulf. The unit is elegantly furnished and decorated. There is also TV in every room and a Play Station 3. Rental is available for long term leasing, as well. Please contact owner for information. TV in all rooms, Beautiful electric fireplace in master bedroom. Nice property. But confusing for a first timer. Didn’t realize there was a club house and exact location of rental. Fortunately meet a person who been there a few times and gave me lowdown. Sorry for your confusing, I am looking for all the texts I sent you that's includes all the information you needed regarding your stay. first text I sent was Wed July 25 and the headline of the text is the address including all the information of the beach club and what you need to do to get the wrist band. 2nd text I send you was your reservation the headline of the reservation is the Beach Club. the beach club was mention 5 times and the address of the property was on your reservation. on Aug 6 I sent you another text with the address and all the information you needed to get in. Aug 10th I received a text from you stated no WiFi. I asked you to go ahead and read the information that was sent to you on July 25 and give you the information over the phone. I call you several time before your arrival and asked you to let me know if you have any questions. lots of information was sent to you all you needed to do just go over the information. sometimes quests are very busy and don't have the time to read the information. VRBO also asked you to down load the Home away app wich include all the information you need regarding your stay. again sorry for the confusion hopefully next time you will have the time to read the information. My fourth time to stay. Love it. Great BaySide Property- owner was awesome! We loved this condo! Roomy enough for 4 adults and 3 teenagers. It had everything we needed for a very comfortable stay. We had views of the gulf and bay. The only downside was that we had to drive to get to the beach club/beach access- which was fine. The condo overlooks the lazy river/pool area, so it was great to let the teens go swim while the grown-ups watched from the balcony. The large dining table was perfect for our family game night! The owner was very timely in responding to questions. We will definitely be back! Beautiful home and a perfect location! Thanks for choosing our condo for your family vacation .thanks for taking good care of the condo during your stay. We love to have you back. You are very kind. Thanks for choosing our house for you family vacation, thank for taking great care of the Condo during your stay, we love to have you back. We had a great time staying with two families with four little kids at this property. Location to the lazy river pool is great and the beach is just few mins of drive. The owner is quick at reach and accommodating. Will definitely stay again next time.